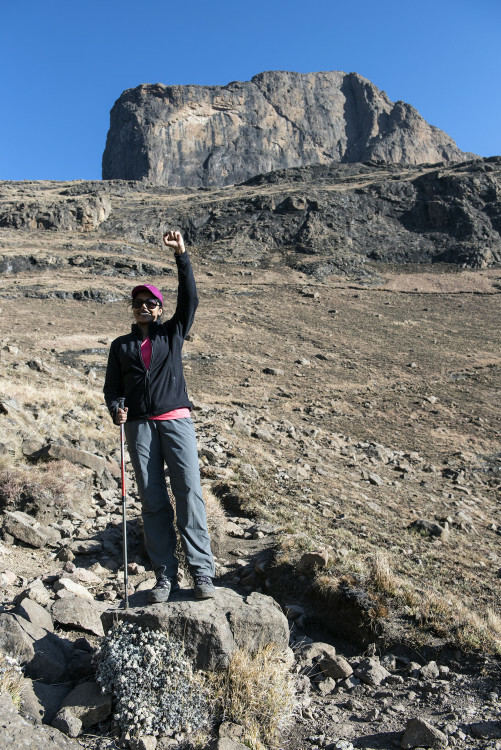 Tackling the Drakensberg Amphitheatre with a disabling fear of heights and sedentary city-lifestyle are some of the challenges that newbie-hiker Ishay Govender-Ypma faces head-on in the Drakensberg. For Business Day 22 Jan 2016. The first chain ladder, a lengthy iron contraption that extends higher up than my eyes care to see, isn’t exactly what I expect. Neither is the second. The 50-odd wrungs are thin and curve over a face of the mountain that they’re bolted onto, some with more, and others with less space for hefty hiking boots. The ladders rattle in the wind that howls in greeting as we reach this point. It’s taken us a little more than two hours to get here, hiking from the Sentinel car park on our way up to the Drakensberg Amphitheatre, a jewel in the crown of the Royal Natal National Park. It’s also one of twenty hikes recommended by National Geographic as the best trails to tackle in the world. Many hikers, braver than I, had suggested I use the newer ladders on the right, not the seemingly free-swinging ones of the left, installed in the 1930s by resort developer Otto Zunckel. All those hours of staring at Internet images of the dreaded ladders (“avoid if you’re afraid of heights”, some posts warn), seem insufficient. A punishing month of training after months spent roaming cities on assignment – in restaurants and museums mostly, here we are: me, and my creeping terror of heights. A pursuit for the birds? Nvula (Samson) Machobane, our guide from nearby Phuthaditjhaba in the Free State, has folded my small backpack into his, and is walking behind me on the ladder. For a good few minutes before we start, while we’re refuelling on naartjies, juice running a sticky path down my forearms, I wish I could crumple myself as easily and sneak into that backpack too. My sporty Swedish friend Kat, who talked me – the food writer who’d over the years rounded in shape with the consumption of too many bread sticks and sedentary on-deadline snacks, into this week of adventuring, is here too. She’s silent, platinum blonde hair fixed in a ponytail, flashing against her pale sweater. She’s amazed I haven’t complained once (she tells me later), and I suspect she’s a little worried too about what may transpire as I determinedly follow her up the ladder, with Samson trailing behind me. Samson matches my every slow and deliberate step, encouraging. “You’re doing so well. That’s it,” he says. “Thank you,” I reply, grateful to hear his voice, listening to my breath wheeze noisily in my ears and above the wind that’s staging a tough competition. This is not exertion brought on by fatigue, though we have gained not insignificant altitude over the past two hours or so of careful climbing over narrow paths and thin surfaces clinging to the edges of the mountain face, pausing to take in the Witches, the Sentinel and Lesotho’s magnificent Maluti peaks. My change in breathing isn’t because my hands and arms have engaged in a titanic effort to keep my body from plummeting (in case my legs should give in, being my mind’s contribution to the matter). I feel my biceps clench, straining my shoulders and my fingers adopt a claw-like grasp, welding to the ladder’s circular grips as my shins graze against the wrungs. No, this laboured breath is born of fear. And more than the abstract fear of the thing – heights on unpredictable, hostile mountains, in this case, it is the fear birthed in the act of trying to survive. And it spurs me upward, one double-footed wrung at a time. The tears that spurt momentarily (to my embarrassment), remind me of my shortcomings, and to my relief, the utter joy of being alive. That much adrenalin coursing through your veins will do that too. 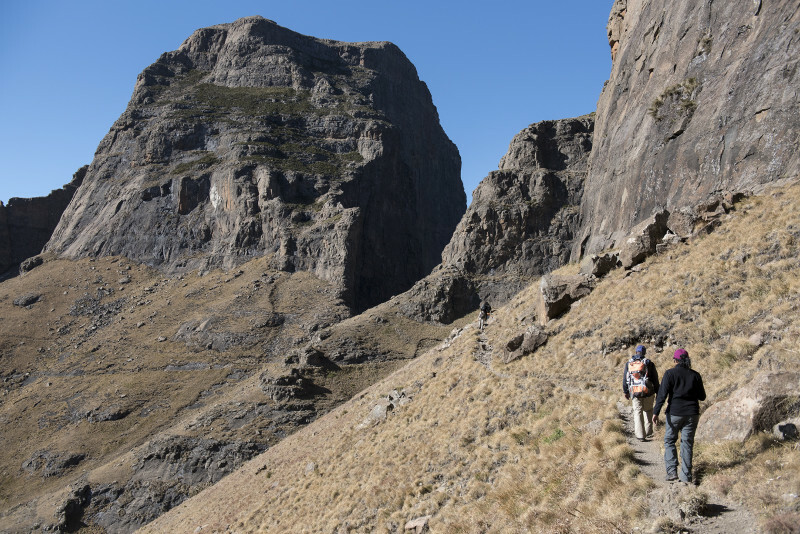 After a similar effort up the second chain ladder, we walk in silence along the mountain plateau where a puny stream that funnels into the mighty Tugela River has frozen in places. 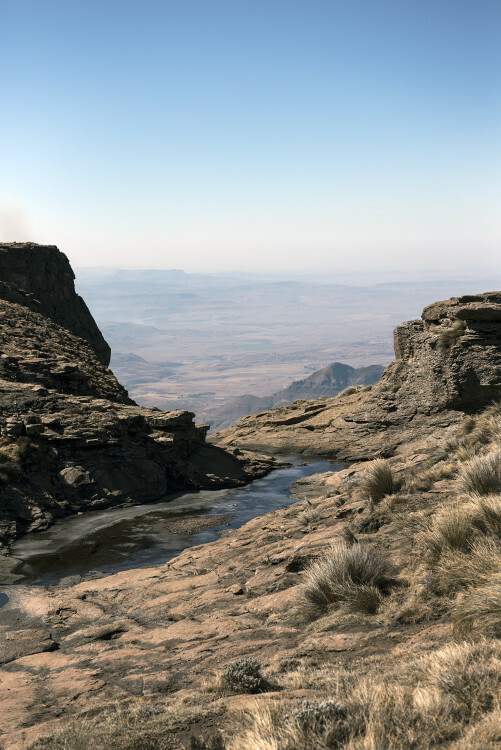 After 30 minutes, and one and a half kilometres of flat trekking, we are at the edge – the Drakensberg Amphitheatre, and a virtually symmetrical view opens before us. I stare at the Tugela Falls. Late winter had cast its spell, and the water has frozen in a comical attempt to reach the ground, around 1000 meters below, a feat that makes it the second tallest waterfall in the world. I can’t bring myself as close to the edge as Kat does. “Take a picture of me from here,” she says, handing me her mobile, and spreading her arms out to embrace the view. It’s where her husband, Dalu, proposed marriage. I leave her to enjoy the memories for a moment, walking to the left and watching an agile young couple scramble over boulders. Over packed lunch sarmies, Samson, a mountain guide for the past 11 years tells us about hiking these mountains as a teenager (“to find peace”) and his love of nature. 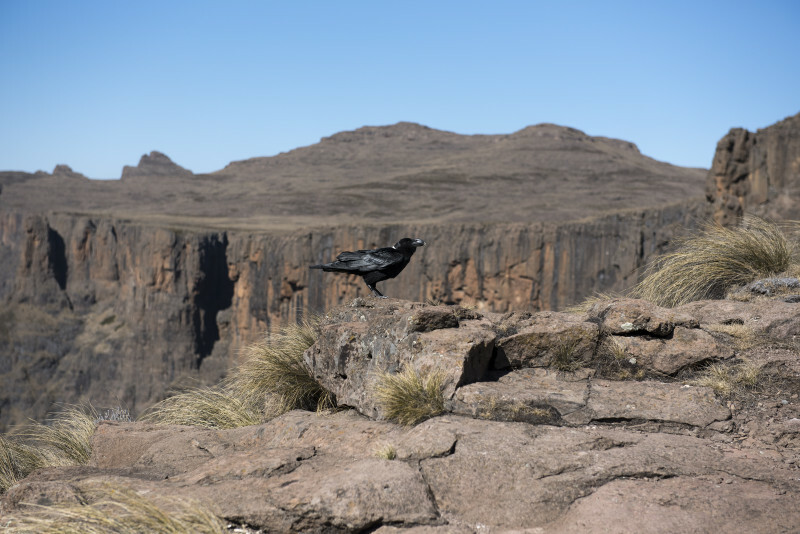 “I can tell you this is the second highest waterfall,” he says pointing towards the Tugela, “but it’s better if you come see it for yourself.” Around 20 percent of his guests opt not to climb the ladders, he shares. He flashes me an encouraging smile. Climbing down the ladders, I find, requires as much concentration. I refuse to look down, but Samson is there, walking behind and giving me wrung-by-wrung feedback. As we near the final step, he says: ”Actually, you’re a strong lady. I don’t think you’re afraid; you’ve got this thing in your head. But you’re doing so well. Believe me.” I can’t tell what the psychologists would make of Samson’s assessment, but one tearful hug later, our little group tackles the knee-crunching 2.5-hour trek to the base in high spirits. The pink papery everlasting blossoms, violet wild agapanthus and barren pineapple lilies take on a new charm. Mink grass flutters on the breeze and golden hills spread in front of us like melted chocolate. In the distance, grey reedbuck wink, before they disappear. Orange-breasted rock jumpers and Sentinel Rock thrush whistle their approval. 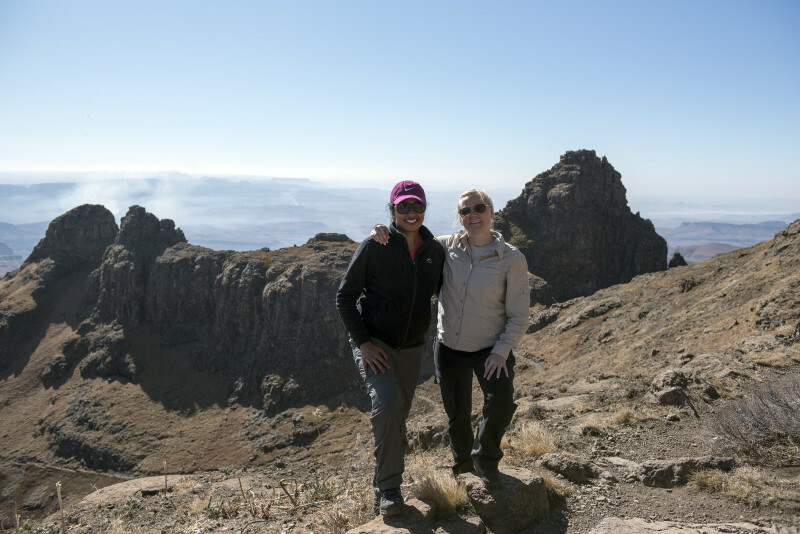 The rocks around The Gulley are rubbly in parts and sharp boulders edges require focus and careful placement of our weary legs, but we exchange witty banter, buoyed by the experience. Having summited the Drakensberg Amphitheatre, a trail I feared for so long, I feel heartened and hopeful, ready to tackle the week of hikes ahead.